Airtel provides a high-speed broadband connection for users with attractive plans. We have been using it for our office for the past two years without having any problems. They provide an almost steady connection by keeping the promised data transfer speed. Their unlimited packages come with a limited number of free calls and for some plans, they offer a free DSL wireless modem. D-Link DSL -2730U modem is installed by them in our office. This tutorial explains how to setup Airtel broadband modem with WiFi feature and share Internet connection and WiFi among multiple computers. Next portion of this tutorial covers how to make customizations for your connection in case of speed, security etc. Type 192.168.1.1 on the address bar of the browser and press enter. Now we can configure airtel DSL ATM Interface with right VPI and VCI values. Remove all previous configurations using the remove button before clicking the add button to set up a new one. Now we are at the major step in configuring airtel broadband access. Enter the following values on this page. Choose strict priority for IP QoS Scheduler Algorithm. After entering all the details provided above, click the Apply button. Once the configuration is completed, you should click on reboot link from the left-hand side menu under Management. Once the Internet connection is configured, we need to set up wireless and wireless security on Airtel modem. 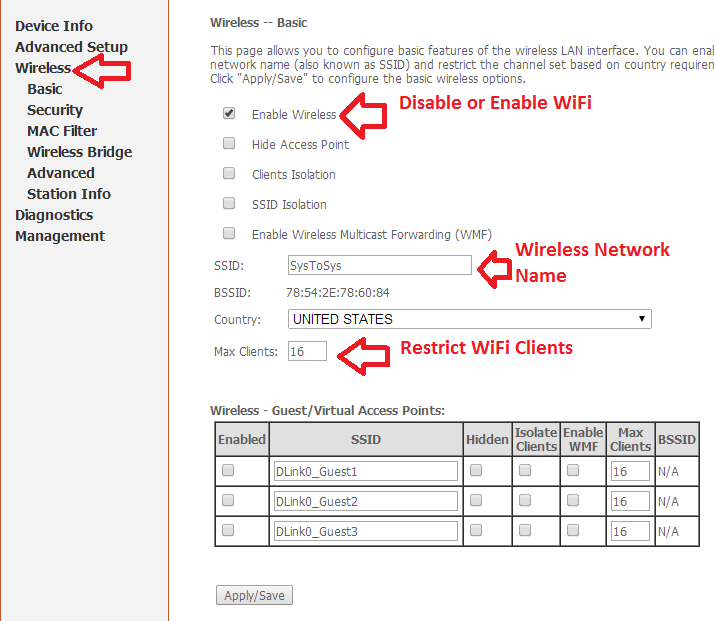 Follow the steps below to enable WiFi and security. To enable WiFi, you must select "Enable Wireless" checkbox. You can create a custom name for Airtel WiFi network by deleting the current entry at SSID and type the name you want. It will be the name of the WiFi network. Don't forget to save the changes using the Save button at the bottom of the page. You can choose open network (no security), WEP (less secure), WPA Personal and WPA Enterprise from Network Authentication. 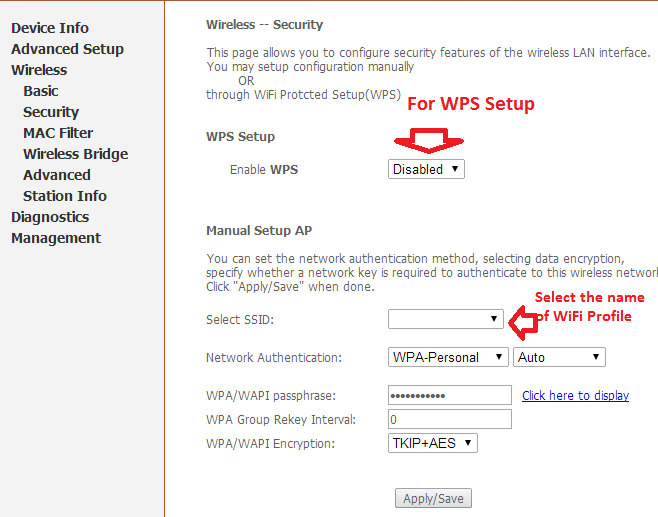 I am using WPA-Personal to secure office wireless network. Save the changes once it is completed. 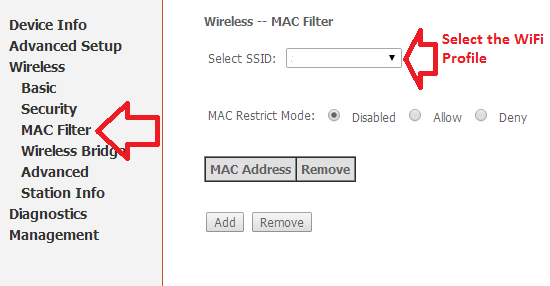 You can block a specific device from joining your Wireless network by banning the MAC address of that device. For that, you must enable MAC filtering. If you are facing troubles with Airtel mobile wireless network, you may follow the steps provided in the link below. Support: This login id is provided to airtel technicians. Those authorized technicians will examine and run diagnosis test while your Internet connection experiences issues. This ID too can update device software along with admin id. User: Though user with this ID can view settings and update software, he cannot change any previous configurations. Type the username (from the three) and old password first and then type the new password. After confirming the new password, click the Apply button. The default login IP address of airtel modem is 192.168.1.1 but we can change it to a different one by following the procedure explained below. 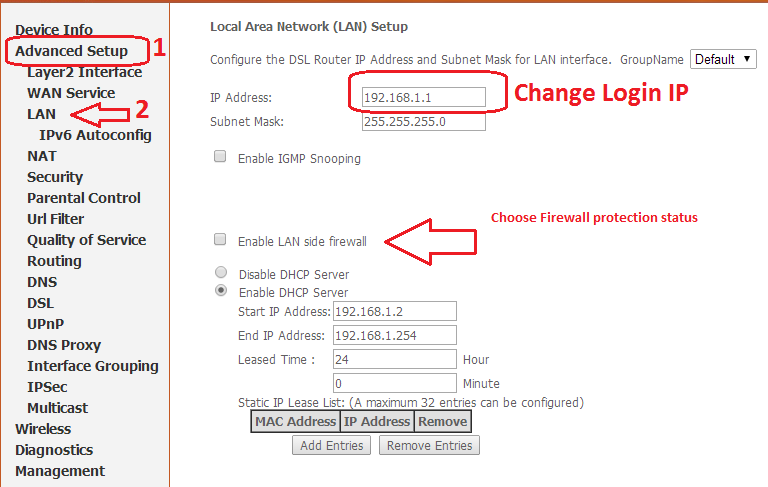 Here we can change the default login IP of the device by changing the IP address specified at "IP Address". If you want to enable IGMP snooping, you must check the checkbox at "Enable IGMP Snooping". The same window gives options to either turn on or disables Firewall protection. If you don't want to share the Internet with multiple computers, simply select "Disable DHCP Server" radio button. After making necessary changes, don't forget to click the Save button at the bottom of the window. By using the feature Parental Control, we can block any websites for users sharing broadband. This feature is configured on the MAC address of the browser's laptop. to set up this feature to block unwanted websites on Airtel broadband connection, follow the steps below. Here you can enter the restrictions by following the Parental Control rules. It is necessary to update the current firmware of the Airtel modem with the latest release. To perform a firmware upgrade, follow the steps below. To download the latest firmware of any models of airtel modems, visit the link below. Save the downloaded file on your desktop. It is important to download the firmware for the right model. Right now they have listed firmware for Beetel Wi-Fi DSL CPE 450-TC1 and CPE 450-BX1 with Binatone Wi-Fi DSL CPE Model DT845W. If you cannot find firmware for your model, you may search vendor website. Once the downloaded file is selected, click the "Update Software" button. Once the process is finished, the modem will restart. You need to wait at least one minute. If you doubt the actual speed of Airtel DSL connection, you can test it here. You may click the link below to test your current download and upload speed. You can pay airtel DSL broadband monthly bill online by following the link below. Airtel offers extra speed for their DSL users with extra payment. To learn more about it, visit the link below. If you are not planning to pay extra for higher speed, I recommend you to follow the instructions provided in the link below. If you are facing issues with Airtel DSL broadband connection, you may use the following information to reach their technical support division. To get the exact broadband hub technical support number (for states and cities), visit the link below. Here you can find the technical department number exclusively for your state or city. You can check your current Airtel DSL Internet usage and bill by login to your account by following the link below.